Consumer IoT solutions are cool, but useless? It seems everyone is doing something with the “Internet of Things”, just like everyone was in “Big Data” 3 years ago, now it’s all about the “IoT”. But what are we actually gaining from all of these connected devices? I now have a page full of apps on my smartphone for all these devices, and sure that’s cool, and man do they make a cool demo at the slue of now IoT trade shows but how are they actually helping us? Are we saving money, by knowing that our refrigerator was 2 degrees warmer while we were putting up our groceries? Sure maybe the smart house has made us more efficient, we save a few dollars because we can now turn our A/C off from our office, but how does this effect business and add real value? Now finally companies and innovators have realized that all of these cool gadgets and innovations make for a cool demo but have little economic value. Many IoT innovation companies have started to migrate from Consumer IoT products and move towards the huge Industrial IoT opportunity. Why? Because an IoT innovation in the Industrial sector can be measured with real ROI and the business impact figures can be staggering. At the IoT Solutions World Conference in Barcelona (going on this week), IBM stated that 70% of the IoT value will be created in B2B use cases. They also stated that by 2025 IoT will have an economic impact of $11.1 Trillion PER YEAR. We participated in two large international IoT conferences this year. Predikto was voted best startup at one of these conferences in San Francisco. There is a lot of interest in our underlying technology, but our actual traction comes more from tangible use cases than cool demos. The small number of tangible use cases presented at these IoT conferences by participating companies appalled me. I was in a breakfast meeting with business leaders and analysts one morning. One of the analysts asked the group for examples of real Industrial IoT use cases and it was crickets. Predikto was likely the smallest firm in the large table of 20+ people, and we were the only ones who could speak to use cases in the Industrial sector with real scars from what is working and what is not. Many of the others were speaking in hypotheticals and regurgitating what they read in blogs and articles. There are over 12 different IoT market size figures quoted by leading companies. I mentioned IBM figures above, but others include: Cisco $19 Trillion in net profits by 2022, Gartner $300 Billion in incremental revenue by 2020, GE $15 Trillion added to global GDP in 20 years, and the figures go on and on. 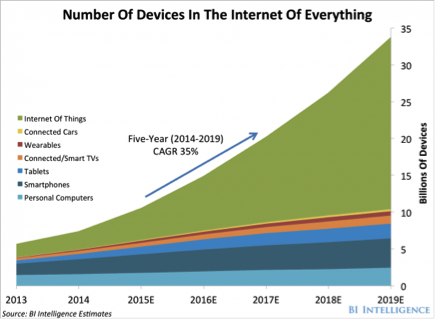 If you look at connected devices, the chart below from Business Intelligence shows 34 Billion connected devices by 2019. Where will all these new revenues come from? I believe the bulk will be from the Industrial side of IoT. I am getting tired of all of the hype about IoT. The reality is that most of the consumer IoT solutions and use cases are losing traction after the cool factor wanders off. Wearables have a dirty little secret; A survey by Endeavour Technologies shows that 50% of wearable users lose interest after a few months. What real value is there in being able to monitor your refrigerator or toaster from your iPhone? I can see some value in my coffee machine automatically turning on 20 minutes earlier along with my alarm shifting forward by 20min because Waze is recognizing heavier traffic in the direction of my first meeting that morning. Sure, but how many people will actually be using that type of integration and how do you provide measurable ROI in some of these use cases. Cool? Yes. Measurable impact with clear ROI? A lot more challenging to justify. At Predikto, we are focused on planes and trains at the moment. We see clear tangible impacts to safety, operations, and maintenance optimization through our ability to help clients deliver tangible value to their real business problems.